Extra Vision Showcases are designed without a wood base and are intended for displaying the maximum amount of merchandise. The spacious glass display is a full 32” high with only a 6” kick base for support. The structure of Extra Vision Showcases lets your customers focus directly on the products displayed. The overall dimensions of a standard Extra Vision showcase are 38” high and 20” deep, with 4 different lengths available. The glass case is 32” high and 20” deep. The recessed black kick base is 6” high. 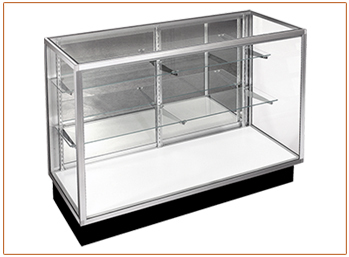 Extra Vision showcases have one row 8” deep and one row 10” deep glass shelving. The 36” and 48” showcases come with one shelf per row; the 60” and 70” showcases come with two shelves per row.